Westgate House01263 715779work01603 870304fax Self-cateringWestgate House, a house from the 17th century, is spacious and situated close to ancient Priory remains and the village amenities of Binham in North Norfolk. Holt, an attractive market town is eight miles away, and the coastal town of Wells and the village of Blakeney with its marshland walks and boat trips to see seals at Blakeney Point, are only a few miles away. Impressive front view of Westgate House. 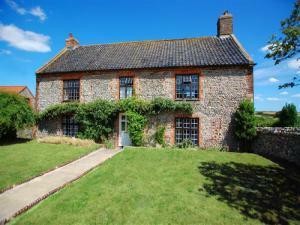 Westgate House, a house from the 17th century, is spacious and situated close to ancient Priory remains and the village amenities of Binham in North Norfolk. Holt, an attractive market town is eight miles away, and the coastal town of Wells and the village of Blakeney with its marshland walks and boat trips to see seals at Blakeney Point, are only a few miles away.